Arrive at Nuremberg Airport. If your cruise package includes a group arrival transfer, or if you have purchased a private arrival transfer, you will be greeted by a Uniworld representative and transferred to the ship. For an over-the-top, old-world holiday extravaganza, look no further than Nuremberg, which boasts the largest and grandest Christmas market in all of Germany—and that’s really saying something. The “Gingerbread Capital of the World” pulls out all the stops during the holidays, as you’ll see for yourself on a panoramic tour guaranteed to put you in a festive mood. You could not ask for a more perfect place to begin a celebration of the holiday season than Nuremberg. The historic Old Town is an archetypal German medieval city and home to a world-renowned gingerbread called lebkuchen. Spend a leisurely day onboard as you cruise along a marvel of modern engineering, the 106-mile-long Main-Danube Canal. Tonight, celebrate Christmas Eve in the enchanting town of Regensburg. For more than 1,200 years, European leaders dreamed of linking the great rivers of Central Europe: the Rhine, Main and Danube. 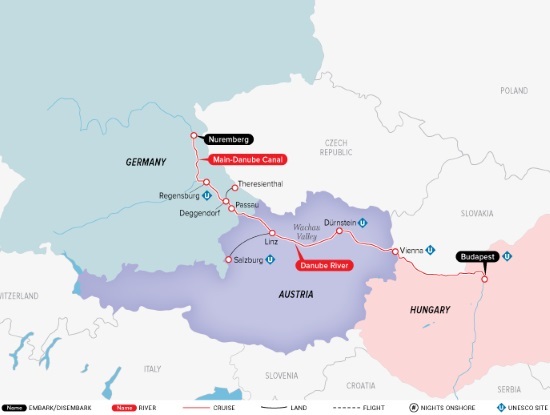 And in 1992, an engineering masterpiece, the 106-mile (170-kilometer) long Main-Danube Canal, made this dream come true. This masterwork allows ships of all shapes and sizes to readily transit from the Rhine Delta in the Netherlands to the Danube Delta in Romania, connecting the North Sea to the Black Sea. The canal crosses the European Divide at 1,331 feet (405 meters) above sea level, climbing the summit by way of a series of impressive locks; the highest will lift your boat about 83 feet (25 meters). The canal then follows the natural course of the Altmühl Valley, a picturesque area of limestone mountains and Franconian villages, before it joins the Danube near Regensburg. Don’t miss the fascinating process as your ship navigates the locks—or the wonderful scenery on either side of them. You’ll arrive in Regensburg this evening, with the town celebrating Christmas Eve. You’ll be free to explore the UNESCO-designated medieval city on your own, and if you like, you may attend midnight Mass in one of Regensburg’s historic churches. The Old Town of Regensburg sparkles with holiday lights and decorations this time of year, adding to its already considerable charms. Check out the best and brightest cultural sights with a choice of tours—you can either plunge you into the town’s ancient past or explore its fascinating Jewish history. Tonight, there’s a festive Christmas celebration onboard. Your first port of call on the Danube, Regensburg is a friendly town with quaint cobblestone streets, medieval alleys and ancient Roman ruins. Goethe thought that it was “so beautifully situated; this region had to attract a town.” And attract a town it did—Roman legions founded Regensburg 2,000 years ago, calling it Castra Regina. It prospered over the centuries, not just because of its beautiful location, but also because ambitious and far-seeing locals built a bridge over the Danube back in the 12th-century. Thanks to that bridge, Regensburg became an international trading hub and, at one time, the capital of Bavaria. In the morning, you’ll have time to attend Christmas Mass in one of Regensburg’s beautiful churches. Is that the sound of…jingle bells? Yes indeed, but that’s not Santa’s sleigh you’re hearing, it’s a horse-drawn wagon whisking you through the densely wooded Bavarian Forest. This area is known for glass-making, which you’ll observe close-up at a famous workshop. After a morning cruising the enchanting Danube, you’ll arrive in Deggendorf, gateway to the Bavarian Forest. Located at the confluence of three rivers, Passau is a lovely place to take a stroll with a local expert who will regale you with stories about the town’s colorful (and ancient) past. Christmas may be over but the holiday spirit is still at its peak in Passau. Perhaps, enjoy a traditional holiday celebration in a festively decorated barn. Luxuriate onboard this morning as your floating hotel cruises down the majestic Danube toward Passau. Old Town Passau is built on a spit of land that looks almost like a ship with its narrow prow jutting into the water, a fitting shape for a city that has been an important center of river trade since it was founded by the ancient Romans. A local guide will be waiting to take you into this delightful and accessible town where the Danube, Inn and Ilz meet. Mozart’s birthplace of Salzburg is nestled in a glorious alpine setting that sparkles like a winter wonderland. You definitely chose the perfect time of year to explore this refined and much loved city. If you’re a fan of The Sound of Music, all the better—you will recognize locations from the Oscar-winning film in the city’s Old Town. Do-Re-Mi! Your ship docks in Linz today, where you may travel to the elegant alpine city of Salzburg. After a scenic cruise through the Wachau Valley, we’ll reach the village of Dürnstein. Walk along the cobbled streets, browse the shops selling apricot schnapps and maybe take a quick jaunt up to a ruined castle (with an intriguing tale all its own). Later, taste various mulled wines and attend an organ concert at an Augustine church, followed by the highlight of the day—a private cocktail reception at Artstetten Castle, hosted by a bona fide princess. Make your way to the lounge in the morning to marvel at the scenery of the Wachau Valley. The Wachau is the 19-mile (30-kilometer) stretch of the Danube that cuts through a rocky gorge amid the foothills of the Bohemian Forest between Melk and Dürnstein. This beautiful region, with steep, densely wooded slopes on the south side of the river and a mixture of crags and south-facing vineyards on the north, was declared a World Heritage Landscape by UNESCO. Dotted along the banks are small historic towns and winemaking communities. Some of Austria’s finest white wines are produced from grapes grown on the terraces that cling to these rocky slopes. Renowned for its art and architecture, its classical music, its decadent pastries and its famous former residents, Vienna is a cultural treasure trove. Experience this elegant city with your choice of excursions, and enjoy VIP access to an extraordinary collection of art. To see these masterpieces in complete privacy is an extra special treat reserved solely for Uniworld guests. Some people celebrate New Year’s Eve by watching the ball drop in Times Square. But not you—this year, you’ll be celebrating it in grand old-world style, with a gala dinner and dancing at a Viennese palace. (And that’s just one of two palaces you’ll visit today.) Definitely a memorable way to kick off 2020. Begin the day with a visit to a palace that pays tribute to the taste and wealth of the Habsburg emperors, spend some time exploring Vienna on your own and then ring in the New Year in style. After enjoying some extra free time to explore Vienna on your own, relax onboard as the ship cruises to Budapest. You have the morning at leisure. You could relax onboard or ramble through glorious Vienna. Of course it is a holiday, so most places are closed, but the streets themselves are so beautiful, it is well worth strolling through them. You could go to Karlsplatz, which is dominated by the magnificent baroque Charles Church (named for Emperor Charles VI, who commissioned it) but also boasts a pair of charming Secession (as the art nouveau movement was known in Vienna) pavilions by Otto Wagner. In the afternoon, your ship will cruise toward Budapest. Located on opposite sides of the Danube, Buda and Pest each has a distinctive character and allure all its own. You’ll get a taste of this dynamic capital with a city tour that will show you all the highlights. Your ship arrives in the fabled capital of Hungary this morning. Budapest, formerly two towns, Buda and Pest, on opposite sides of the river, began as a Roman encampment in the second century and has been controlled by Germans, Austrians, Ottomans and Communists over the centuries, all of whom have left their mark. Disembark the ship. If your cruise package includes a group departure transfer, or if you have purchased a private departure transfer, you will be transferred to the Budapest Ferenc Liszt International Airport for your flight home. If you’re looking to celebrate the holidays and welcome the New Year in incredible style, this special cruise is for you. You’ll sail through Germany, Austria and Hungary along the shimmering Danube and past incredible sights on this unique itinerary. Explore charming old-world villages and Gothic cathedrals, and escape the hurry and hassle of the holidays as you relax onboard a luxurious ship and cruise through the ravishing landscapes of the Danube. On Christmas Eve, walk through the quiet medieval streets of Regensburg to the Gothic cathedral for Midnight Mass. As you pass through the magnificent doors, look up: You’ll see chalk marks invoking age-old blessings for all who enter. Listen to the harness bells chime as you ride through the serene Bavarian Forest in a horse-drawn wagon. Wander through locations from The Sound of Music in beautiful Salzburg and then warm up with rum-laced coffee. Meet Habsburg royalty during a private reception in a castle overlooking the UNESCO-designated Wachau Valley. Visit stunning churches and sample delicious wines in enchanting baroque villages. Ring in the New Year dancing in a real Viennese palace, and see how a dusting of snow adds to the glamour of Hungary’s historic capital. The mighty Danube takes you through three nations decked in all their holiday finery at this most delightful time of year. Who will enjoy this cruise? Those who wish to just get away and relax during the busy holiday season, and anyone seeking to celebrate Christmas and welcome in the New Year in an extraordinarily memorable way. Prices exclude additional port charges of $310 per person.